A balut is a fertilized duck (or chicken) egg with a nearly-developed embryo inside that is boiled and eaten in the shell. Popularly believed to be an aphrodisiac and considered a high-protein, hearty snack, balut are mostly sold by street vendors in the regions where they are available. 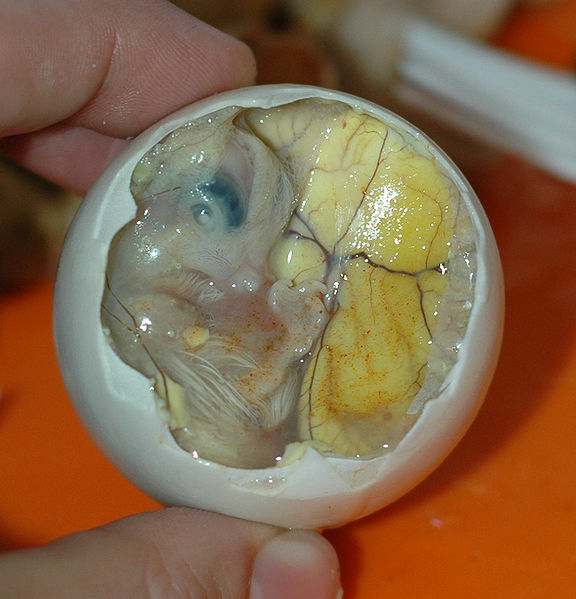 Left: Partially shelled balut egg showing yolk and chick. It is commonly sold as streetfood in the Philippines. They are common, everyday food in some other countries in Southeast Asia, such as in Laos, Cambodia, and Vietnam. They are often served with beer. The Filipino and Malay word balut (balot) means "wrapped" – depending on pronunciation. Balut are most often eaten with a pinch of salt, lemon juice, plus ground pepper and Vietnamese Coriander leaves (Southern Vietnamese style), though some balut-eaters prefer chili and vinegar to complement their egg. The eggs are savored for their balance of textures and flavors; the broth surrounding the embryo is sipped from the egg before the shell is peeled and the yolk and young chick inside can be eaten. All of the contents of the egg are consumed, although the whites may remain uneaten, due to its cartilage-like toughness depending on the age of the fertilized egg. In the Philippines, balut have recently entered haute cuisine by being served as appetizers in restaurants: cooked adobo (a common cooking process indigenous to the Philippines) style, fried in omelettes or even used as filling in baked pastries. 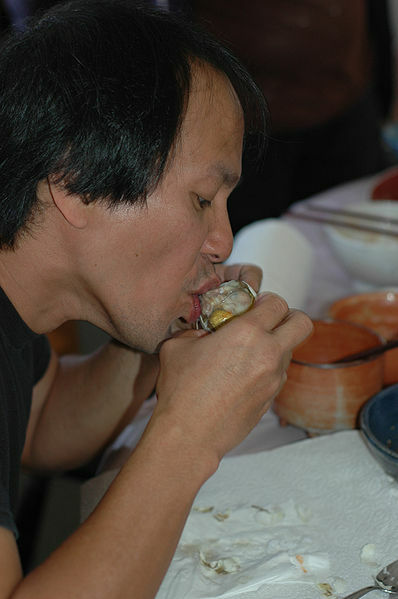 Balut-making is native to the Philippines. Fertilized duck eggs are kept warm in the sun and stored in baskets to retain warmth. After nine days, the eggs are held to a light to reveal the embryo inside. Approximately eight days later the balut are ready to be cooked, sold, and eaten. Vendors sell cooked balut out of buckets of sand (used to retain warmth) accompanied by small packets of salt. 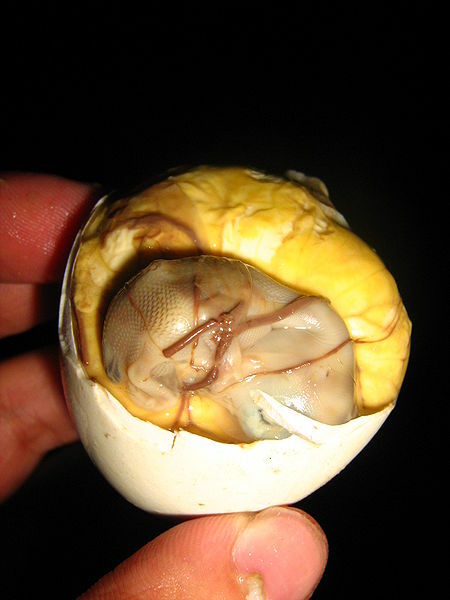 Uncooked balut are rarely sold in Southeast Asia. In the United States, Asian markets occasionally carry uncooked balut eggs. The cooking process is identical to that of hard-boiled chicken eggs, and baluts are enjoyed while still warm. Duck eggs that are not properly developed after nine to twelve days are sold as regular hard-boiled egg. In Filipino cuisine, these are occasionally beaten and fried, similar to scrambled eggs, and served with a vinegar dip. The age of the egg before it can be cooked is a matter of local preference. In the Philippines, the ideal balut is 17 days old, at which point it is said to be balut sa puti ("wrapped in white"). The chick inside is not old enough to show its beak, feathers or claws and the bones are undeveloped. 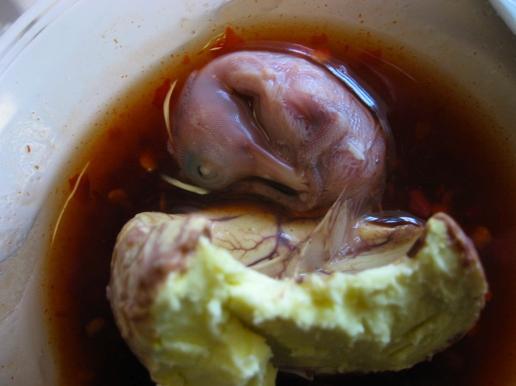 Left: Fifteen-day-old balut egg floating in a mixture of hot sauce and patis. The Vietnamese prefer their balut matured from 19 days up to 21 days, when the chick is old enough to be recognizable as a baby duck and has bones that will be firm but tender when cooked. In Cambodia, it is eaten while it is still warm in its shell. It is served with nothing more than a little garnish, which is usually a mixture of lime juice and ground pepper. Left: Underaged balut with visible chick.